We all have some degree of leaky gut, as this barrier is not completely impenetrable (and isn’t supposed to be!). Some of us may have a genetic predisposition and may be more sensitive to changes in the digestive system, but our DNA is not the only one to blame. Modern life may actually be the main driver of gut inflammation. There is emerging evidence that the standard American diet, which is low in fiber and high in sugar and saturated fats, may initiate this process. Heavy alcohol use and stress also seem to disrupt this balance. We already know that increased intestinal permeability plays a role in certain gastrointestinal conditions such as celiac disease, Crohn’s disease, and irritable bowel syndrome. The biggest question is whether or not a leaky gut may cause problems elsewhere in the body. Some studies show that leaky gut may be associated with other autoimmune diseases (lupus, type 1 diabetes, multiple sclerosis), chronic fatigue syndrome, fibromyalgia, arthritis, allergies, asthma, acne, obesity, and even mental illness. However, we do not yet have clinical studies in humans showing such a cause and effect. 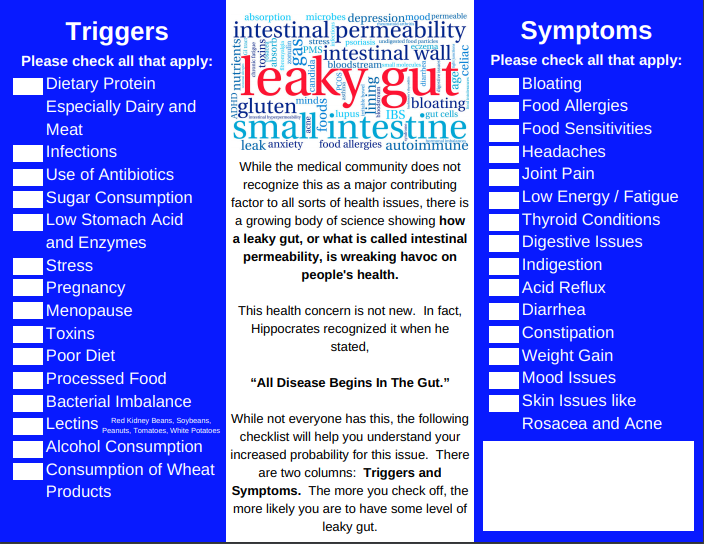 Later on this page you will find a Leaky Gut Survey to help you answer the question: do you have a leaky gut? But first, let’s examine some of the comments made by Dr. Marcelo Campos. He highlighted “gut inflammation” may be the main driver of this issue. He talked about the standard American diet, “which is low in fiber and high in sugar and saturated fats” as a contributing factor for gut inflammation. Below is an image of our Leaky Gut Survey. It lists certain key triggers and symptoms. Please understand that it’s not intended to treat, cure, or determine any type of medical condition. But it will help you begin to think about this potential gut health issue. The more items you check off, the greater your probability of having a leaky gut. 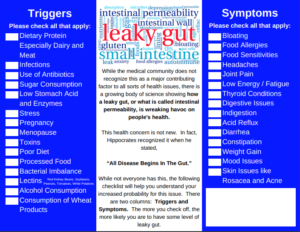 If you want to download this Leaky Gut Survey, then please click here. While there is confusion in the medical industry about whether a leaky gut is a health factor, all of them would agree that certain changes in your diet improve your digestive and gut health. I’ve posted previous blog articles to help you in this area. And there will future blog articles to help you address gut health.